As you might have noticed, we made some tweaks and improvements to the news feed, in order to make it more user-friendly. Party Presidents and Military Unit Commanders can now remove posts they consider unfit for their feeds, eliminating the need for external moderation. The posts on achievements have been compressed for a better view. However, you can still see the details if you want to. Unread messages on Feeds are marked so that you can catch up with them whenever you log in. Moreover, you can now obtain the link of a post much easier and share it with your friends! We hope you enjoy the new feed layout and its upgrades and we'd love to hear your opinions on it. Its great update. I love the dedicated country feed and the link to post and the hidden achievments, BUT PLEASE return old alerting system on posts. For one post i received 15 different alerts, 13 on votes and 2 in comments. please change the order of people who voted/commented on a post in notifcations. Before it was newest voter. old voter, now it's old voter, newest voter. So if you want to see who voted your post, you have to go your post, that's lame. Gee, Brain, what do you want to do tonight? The same thing we do every night, Pinky - try to take over the world! Speaking of links, will we be able to see old posts before the update? I had some saved links with active internet arguments on old posts that are happening since years. Also is the limit of comments per post increased? Before it was 127 comments and then the post becomes buggy. If not, pls fix while you still work on this. Edited by LIKE A B0SS, 27 July 2017 - 08:44 AM. Great improvement but old buggs are present as other already said. p.s. Please reconsider some changes in political module and find a way to eliminate multie farming in parties also in voting on the elections. Limit that or eliminate it othervise is useless module. Anyone can make multies and outnumber the other parties an hour before elections day like thay do right now. Make more harder conditions to possible voters. Like activity by the month, week and day in comunity , number of login per week or month ,or something like that. Ban the multie makers not just multies. Nice tweaking towards a better and simpler feed system. There are few bugs as described above, as well as it could do some further tweaking as FHK said. 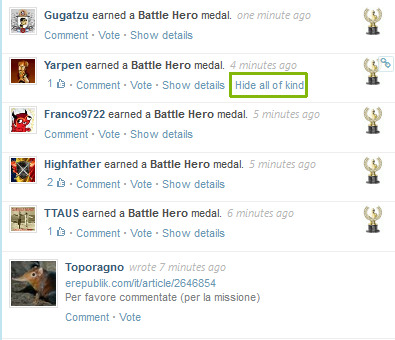 1) For the same post, we receive different alert when different player votes/comments it. 2) When I click an alert regarding a post in the country feed, the post doesn't show. 1) The country feed wouldn't have all international events . 2) The post limit would be the typical 10 minutes, instead of the 120. Else, do it like 15-20 minutes, if you want to avoid spam. Another bug (if we want to call it like that) which is old: when a person comments again in the same post, after our own comment, we won't get the alert. Can you fix that? It would be really helpful, cuz I don't want to everytime to visit my posts to see if someone has replied to what I commented. Edited by Jimkats1, 27 July 2017 - 11:41 AM. I found there are some votes from other countries on country feed. Even the author doesn't have any connection with these voters. I think the country feed is only for the country's citizen. So, is it a little bug with voter for posts? Thank you for the new National Chat Plato. Let's please improve it as soon as possible to allow all citizens to write posts... not just those in government. P.S. My friends... if we cannot have democracy in real life as it appears we can't, at least let us approach that ideal within the game. I hope we can be more equitable and egalitarian with our plans for this new chat room. All citizens should be respected and heard. Their voices matter. Edited by Rican, 27 July 2017 - 10:13 PM. ... the scenery never changes. Is it still the same as before regarding the first 2000 friends can see your shouts? I disagree. Ordinary citizens can comment on the country feed posts freely. I feel it is good that there is an "official" channel with easy battle orders from the executive for the whole population to see. If everyone could post, it would get filled with spam and make the BO's hard to spot. Friends feed is for normal spam, country feed can be used by congress for transparency and government for information - without excessive unnecessary HUEHUE's. Why I can't comment on this law post? It says You are not a member of this group. Edited by LIKE A B0SS, 15 August 2017 - 06:37 PM. Because you are not a member of congress nor the government. Messages like those can only be answered by one of those(congress or gov). The other feed messages should be available for you to comment on. I can comment on donation laws. But not on impeachment.